In 2016, vehicle ownership reached 5.7 million in Beijing, roughly equal to the total number of registered vehicles in all of Sweden. The soaring number of cars and trucks on the roads have made Beijing one of the worst cities to commute in. According to Gaode Map, commuters spend an average of 31 minutes per hour in traffic jams during peak times. Having realized that expanding capacity can simply induce more travel demand and worsen congestion, Beijing’s government is experimenting with a number of TDM strategies. 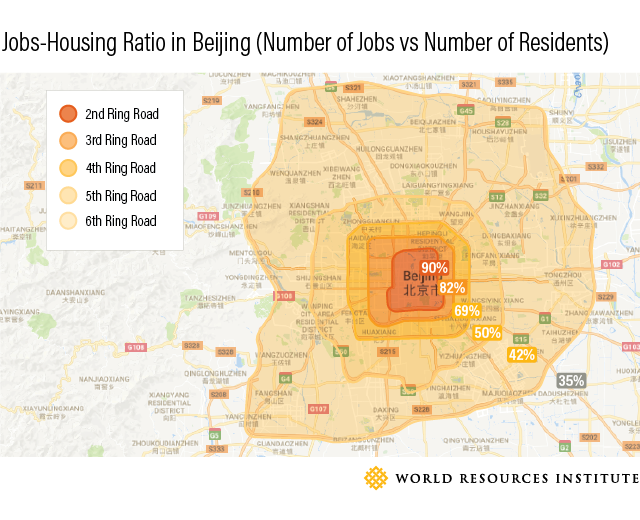 While most jobs are distributed evenly between the five major ring roads of Beijing, half of all residents live outside of the Fifth Ring Road. This skewed balance between jobs and housing, a result of disordered urban sprawl, has led to unevenly distributed traffic patterns and congestion during rush hour. Additionally, the city center is incredibly dense, for both jobs and housing, imposing high transport and environmental costs on the area. One way to curb traffic is to reduce the number of residences and jobs in the city center. To this end, the municipal government is planning to decentralize the city into four main areas serving political, cultural, international communication and scientific functions. Additionally, government agencies and affiliated organizations are being moved to Tongzhou district, a satellite town 20 kilometers southeast of the city. Following government-related jobs, some 400,000-500,000 residents are expected to move from the city center to Tongzhou by 2030. The central government also plans to move non-state owned companies out of Beijing in the hopes of reducing population and job density in the city center. In addition to decentralizing Beijing, the government is considering implementing congestion charging to reduce traffic. Congestion charging is one of the most effective TDM measures, with demonstrated success in London, Singapore and Stockholm. The idea is to alleviate congestion by curbing travel demand without increasing infrastructure. Serious discussion about the possibility of congestion charging in Beijing started in May 2010, when former Deputy Minister Qiu of the Ministry of Housing and Urban-Rural Development published an article in a Chinese academic journal suggesting it could be an effective solution. A key element in the success of congestion charging is public support. Partnering with Beijing Jiaotong University, WRI China recently carried out a social media analysis of congestion charging from 2010 to 2017. The project provides a preliminary understanding public sentiment toward congestion charging. In addition to social media, WRI China partnered with Beijing Jiaotong University to conduct two public opinion surveys in 2016 and 2017, each involving more than 10,000 residents. One result of the surveys is that people tend to be more supportive of congestion charging when they are better informed. WRI China is dedicated to promoting public education and communication around congestion charging to help residents understand how it works and what it can do. The team has assisted the Beijing Municipal Commission of Transport in engaging with residents in the policymaking process, utilizing multiple channels to reach residents, including brochures, blogs, TV programs, trainings and seminars. The results seem to be positive. 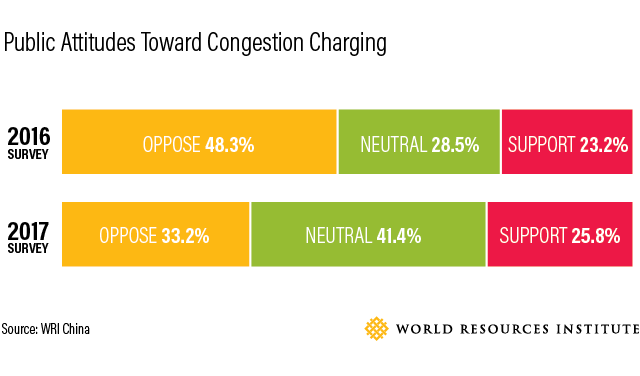 Following the second survey, public acceptance of congestion charging increased from 23 to 26 percent, and there was a 15 percent shift from opposing to neutral. Beijing has experimented with other TDM measures, including regional traffic and vehicle ownership restrictions. In May 2016, the municipal government suggested dynamic tolls, an increase in parking fees, and consideration of congestion charging and dynamic fees for public transport and taxis (higher cost in peak hours and lower costs off-peak). In April 2017, the department released a draft of new parking regulations, which require dynamic parking fees according to parking location, length of stay and arrival/departure time of parking. Four months later, the government announced a new low-emission zone for trucks within the Sixth Ring Road, covering most of the built-up area of the city. The government is also investing in non-motorized transport infrastructure, flexible working schedules and early bird subway discounts, to discourage the use of private vehicles. The results of these TDM efforts have been mixed so far. In the first quarter of 2017, the traffic delay index increased by 2 percent from the year before, but in the second quarter, the index decreased by 9 percent. The city is still searching for the right measures. 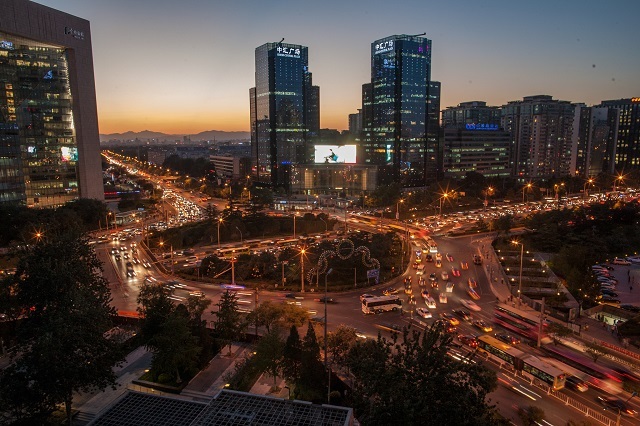 This year, the Beijing Municipal Commission of Transport created a high-tech research and development team to work with universities and research institutes to explore new solutions, and the rising palatability for congestion charging bodes well for more options in future years. Beijing’s challenges are not unique; what’s clear is that Beijing’s experience will provide a valuable roadmap for other cities seeking to reduce congestion and improve the sustainability of their transport sectors. Shiyong Qiu is a Research Analyst for WRI China. Ying Wang is a Research Associate for WRI China.